Its a reasonable assumption that most astrologers have political views that are to the left of the spectrum. This may be what attracted them to the study of the oldest science in the first place. After all if you’re going up against the mainstream thinking in one field, why not go the whole hog and question the overall structure of the culturally dominant philosophy. Or it could be the understanding of other people’s issues automatically makes you more tolerant, so doing charts for people is likely to soften political attitudes as well. The only problem being that some astrological punters might allow their own political beliefs to influence their predictions when it comes to elections. I believe that some astrologers can’t bring themselves to admit to the very real possibility of a Donald Trump Presidency and are clutching at astrological straw transits to shoehorn in Hillary Clinton in November. I am a researcher first and an astrologer second so am not inclined to let my own preferences get in the way of my predictions. For any readers that might doubt this, I offer my prediction that David Cameron would win an outright majority in the 2015 General Election, despite the fact that all the polls and my own political hopes said otherwise. See David Cameron’s Jupiter Return. So when I state that the Conservative Party is a Cancer, the reader can take that as a matter of fact, rather than the loony posturing of some new age crystal ball gazer. As a rule, a researcher should not offer a conclusion before the evidence has been put forward, but I thought I would this time, just to entice more people to read the findings. The common problem that astrologers face when looking at charts for institutions rather than people is working out what the birthchart actually is. Fortunately a colleague of mine who is a historian as well as a talented astrologer has unearthed this one for the Tamworth Manifesto as the birth of the Conservative Party – Tentative Thoughts on the Astrology of Conservatism. When it comes to Mundane Astrology, we don’t place as much emphasis on the Sun sign as we would with natal charts. One reason for this is that political institutions or even nations are often set up at for midnight on January 1st, which would mean their Sun is always at 10 degrees Capricorn in the 4th house. Mind you this could be a very good explanation for the innately conservative nature of institutions in general. As a rule we pay far more attention to the Moon. The Moon is very closely conjunct Mars in Cancer in the 10th. This is a very powerful image. Conservatism means holding onto the status quo, looking after what you have. Some might associate it with Taurus or Capricorn, but Cancer works very well. This is a sign that sets narrow boundaries. Particularly with the Moon in the sign, it is a sensitive and even fearful placing. It recognises vulnerability and does everything it can to protect itself and those close to it. Cancer has a vision of family, of those who belong to the fold and those who don’t. It is fiercely protective of those in its care. The Moon conjunct Mars here will fight very hard against anyone it sees as an outsider. This placing has a very strong sense of us and them. The Tamworth chart has the Moon and Mars in the 10th so this emotional and rather parochial view of the world is projected large. It has a strong sense of nationalism and protectionism. Contrary to some opponents criticisms,the conservatives are not an uncaring party. They care very deeply about those who are in their emotional family, but can have a hard shell when it comes to the needs of those who aren’t. The Moon and Mars are square to Saturn in the 2nd house, so this is the party of fiscal responsibility, even austerity, making the tough choices for the nation’s own good. The author of the Tamworth Manifesto and therefore the first leader of the Conservative party was Robert Peel. Its often true that the individual who starts a movement whether political, religious or otherwise is quite different in character to that which the institution becomes. 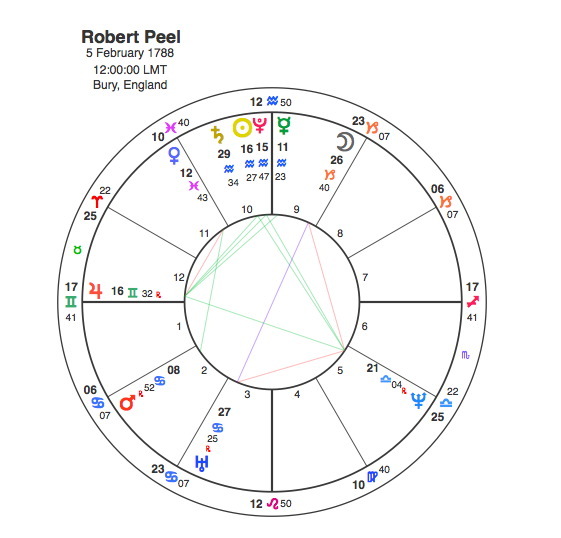 Peel’s chart reflects his impact on British politics. It is very radical. He has the Sun conjunct Pluto in Aquarius with the Moon although in Capricorn opposite Uranus. The Moon in that sign would give conventional instincts but this would be turned upside down by the Uranus opposition. Capricorn Research has a policy with regard to astrological writing. This is to minimise the interpretation of people’s characters and to concentrate much more on events. This is because assessments of personality are much more subjective and open to argument, whereas events occurred, indisputably. So in discussing the political character of someone long dead, to avoid any charge of being subjective, I will simply quote from Wikipedia. So although he started the whole thing, he himself was very much not ” one of us “. The vast majority of Conservative party leaders since were however. Leaving the current Prime Minister aside for the moment, the Conservatives have had 17 leaders since Peel. And its astonishing how many of them have had either the Moon and Mars aspects or major points in their chart in the middle of Cancer. Its particularly interesting that of the first 11 leaders, 8 of them had Moon / Mars aspects. Whereas all of the 6 from the last half century have had prominent mid Cancer placings. Regular readers of these articles will know they are often focused around the transits of Pluto. This is essentially because Capricorn research has only one aim – to prove that astrology works without any possible doubt. And Pluto transits contribute to this aim better than anything else, because they usually correspond to major events in the life of the person or institution and those events are invariably dramatic. The Conservatives have been called the natural party of government. This certainly seemed the case for much of the 19th century, indeed right up until 1906 when it split over the issue of free trade and suffered a landslide defeat and was out of power until the First World War brought the need for a coalition government in 1915. Pluto was opposite the Tamworth Sun from 1907 – 11, a period that coincided with the Conservative party’s lowest ebb until they started to regain influence when the Liberal Unionists merged with them in 1912. Pluto’s conjunction with the Moon and Mars in 1927 – 30 coincided with the Conservatives defeat at the hands of the Labour party in 1929. They emerged once again with the coalition of 1931 where they were the dominant party. Pluto’s square to the Sun 1968 – 70 coincided with another dip in fortunes in the late 60s under Harold Wilson’s Labour government but again they emerged to win the 1970 election. But the biggest phoenix like rise from the ashes would have to be Pluto’s square to the Moon / Mars in 1978 – 9, with the election of Margaret Thatcher in 1979. Tony Blair’s victory in 1997 began an absence from office that was unparalleled in Conservative history, but the renaissance began when David Cameron was elected leader in 2005. 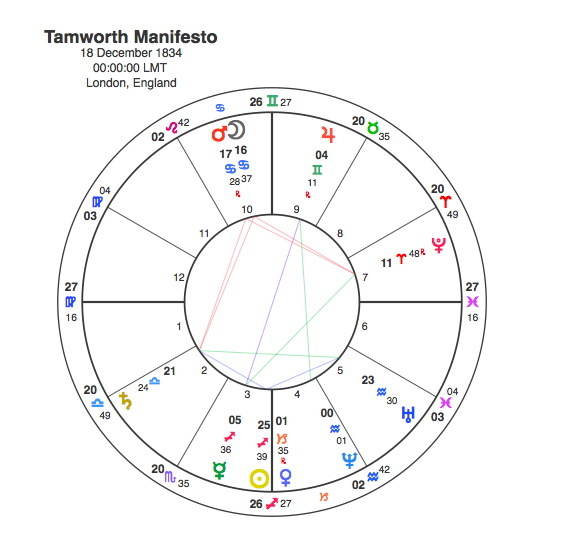 Pluto was conjunct the Tamworth Sun from late 2005 – 2007. The current situation in the Tory party is most interesting. Pluto is now opposite the Tamworth Moon / Mars and will be until the end of 2017. The party seems to be in turmoil over Brexit with the debate becoming increasingly acrimonious. Whichever way the referendum goes we will see change in the Conservative party. If the outs win, it is likely the Cameron will resign. If Britain stays in, most of the outs will fall from power. Most political pundits were taken by surprise by Iain Duncan Smith’s resignation ostensibly over George Osbourne’s budget cuts for disability benefits. A number of reasons were put forward for IDS’ move, most of them focusing on the personal animosity between him and Osborne. It was largely dismissed as a move to put himself in the running to succeed Cameron, mainly on the grounds that he was too stupid. Looking at IDS’ chart, Capricorn Research is not so sure. IDS has the Moon in Cancer closely conjunct the Tamworth Moon. 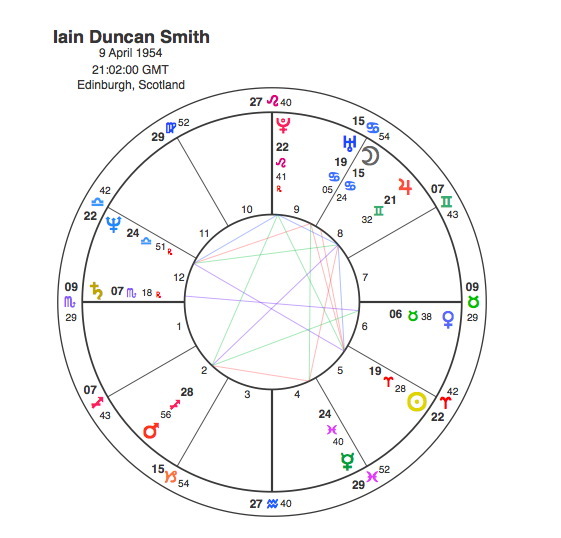 It is also conjunct Uranus, suggesting that Duncan Smith would be a focus for upheaval and change in the party. He also has an exact Sun square Uranus. IDS is not a natural rebel. Up until this point, everyone had him down as a staunch party man and his brief period as party leader showed he was not up to the top job. However with the transitting Uranus conjunct his Sun and square itself and Pluto opposite his Moon, he chucked a very large spanner in the works. Pluto goes on to square Duncan Smith’s Sun from 2017 – 19, so either he leaves politics altogether or becomes Prime Minister. Capricorn Research believes that IDS has felt these patterns operating in his own life. And now was the time to lob in the grenade. By objecting to Osborne’s budget, he has given himself a platform and if the UK does pull out of the EU, Iain Duncan Smith will be in pole position for the top job, having leapfrogged Boris Johnson. IDS’ antics have seriously angered David Cameron, but that’s only to be expected. 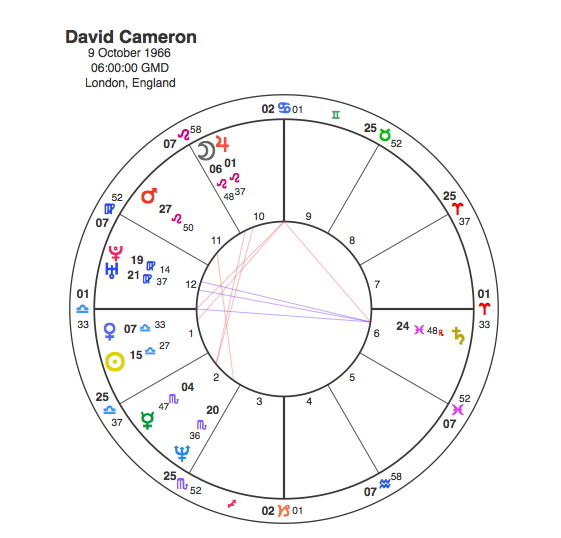 Cameron’s Sun at 15 Libra is exactly square IDS’ Moon and square to the Tamworth Moon / Mars. Pluto is triggering all of them at the moment so we have the current turmoil in the Conservative party. A number of left of centre astrologers have been criticising Labour leader, Jeremy Corbyn for not making the most of this chaos in the heart of the government, but there’s really no need. Just maintain a dignified principled stance and watch the opposing bench continue to unravel over the coming months. As a reader of this article its quite possible you would believe that the Tory party are a Cancer with a small ” c “. I will leave my response in the hands of one of the most well known Conservative leaders, Francis Urquhart from the original version of House of Cards, played by Ian Richardson who bizarrely has the Sun conjunct Mars at 17 – 18 Aries opposite Jupiter at 18 Libra all forming a T Square with the Conservative party Moon / Mars.